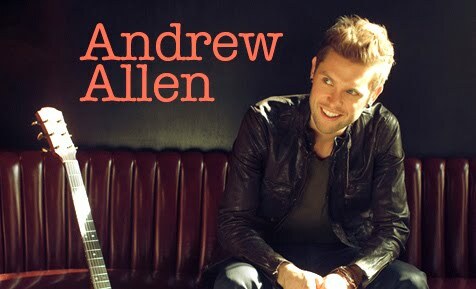 I heard Andrew Allen recently on radio in my car and at a first time of listening his melodies love songs was enough to make myself a fan of him. He looks very soft looking lover guy! !.I found great potential in his singing and magnetic voice in his music only one thing he requires to work on his promotion well but I am sure about this guy that he is gonna take lead on his genre. He recently signed to EPIC Records, and will be touring in support of his lead off single""Loving you Tonight"
Few months back, Video of the song was released for "Loving you tonight". Excellent singing and love song forever!!! Creating more than just a show, Andrew embraces and revels in the experience. He feeds off the audience and returns every ounce of energy back in melody form. From his fun loving 2009 Top 10 single ‘I Wanna Be Your Christmas’ to the smash hit ‘Loving You Tonight’ which was catapulted into the Top 10 on Radio and the Top 100 in iTunes, courtesy of CHUM Radio’s Emerging Artist Initiative, all the way to his soulful ballads like 'Amazing', which he performed in Whistler BC at the 2010 Closing Ceremonies of the Paralympic Winter Games, he somehow knows just how to conduct a show that has you laughing, dancing and most importantly…remembering. I love this number.....Very Nice!!.. "Not Loving you"
Hailing from the sunny Okanagan, Andrew guides his listeners through a musical journey, with stops everywhere from BC’s West Coast to the vibrant tropical influence he acquired while working thru out the Caribbean. Andrew masterfully combines his fresh and original acoustic beach grooves with some mainstream pop overtones, creating an absolutely ear pleasing adventure! It almost seems as if the West Coast vibe feels at home in his tunes. Andrew Allen isn’t just another musician. He’s got that something else, that limitless energy, that infectious smile, that ‘star quality’ that will inevitably take him to the top. He’s authentic, he’s determined and he’s just plain good. His self worth is not defined by the response to the music he creates, but instead it’s demonstrated through the music that he shares. When the room goes quiet and the music begins, just enjoy the ride.